Empty bottles or cans under their bed. Bloodshot eyes. Slurred speech. Does your teenager exhibit one or more of these classic symptoms of alcohol use? Have you caught them drinking? What’s your response? And how do you parent with love when your teenager has clearly disobeyed the law, and your family’s rules? It’s never too late to start the discussion about how to handle teen drinking, but the earlier you do it, the better. According to the 2017 National Survey on Drug Use and Health, nearly ten percent of U.S. 12-year-olds have tried alcohol. That number jumps to 50 percent by age 15. The earlier you start the conversation about teen drinking, the more likely you are to have a strong influence on your teenager. 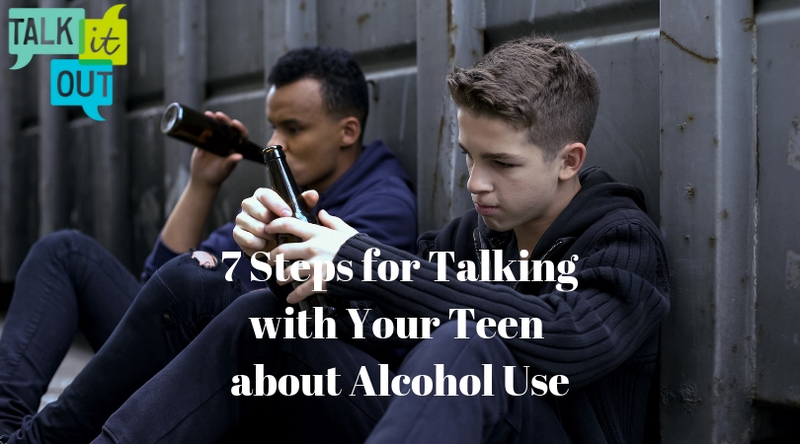 If they’ve already started drinking, there are positive steps you can take to set expectations and enforce your boundaries about your teenager’s future behavior. 1. Learn what they’re living. Open an honest dialogue with your teenager about their life, their challenges, their goals, and their decision to consume alcohol. Ask questions and listen without judgement. Create a safe space for your child to tell the truth. 2. State the facts. Give your teenager age-appropriate information on the developing brain and how alcohol negatively affects it. Talk about what alcohol does in a teenage brain to increase impulsiveness and impair decision-making. 3. Model the behavior you want to see. Be a responsible drinker in your own home and at social events. If you choose to keep alcohol in your house, lock it in a cabinet that’s inaccessible to your teenagers. 4. Get real about responsibility. Explain to your teenager that no one else is responsible for their decisions, and no one else is to blame for their behavior. Restate your family values and expectations. Set and enforce boundaries for acceptable behavior. 5. Determine the consequences. Licensed Professional Counselor Jim Doxey says that with driving-age teenagers, the obvious choice is to take away the keys. “Certainly, if a 16 or 17-year-old is drinking, they shouldn’t have access to a car. That’s a reasonable consequence for a teenager.” Younger teens could lose electronics privileges or receive extra chores. 6. Make decisions about future behavior. Agree as a family to continue talking about how to handle teen drinking. Assess what’s working, and what needs revisiting. Go back to step 1 if you discover a relapse. Seek professional treatment if your child is unable to stop consuming alcohol or begins binge drinking. 7. Show your teen that you love them, and that you care. Above all, remind your teenager that you love them. Remind them that you are committed to working as a family to keep everyone safe and healthy now, and in the future. For more ideas on talking about alcohol with your teen, click here to start the conversation and learn more about the Talk it Out text campaigns. The conversation starters text campaign offers monthly ideas for talking with your child about teen drinking. To opt in, text “starters” and your first name to (919) 404-7013 (example: starters Mary). The parent text campaign gives timely tips on how and when to talk to your teen about the dangers of drinking underage. It can also tell you how to spot if your teen has been drinking, and ideas on how to handle teen drinking. To opt in text “parent” and your first name to (919) 404-7013 (example: parent John). Encourage your whole family to Take the Pledge to prevent teen alcohol use.